We will be holding a talk session having doctors who have been certified by ECFMG. 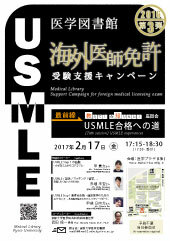 This is a must for those who are planning to take the USMLE. Click the poster to see the map. 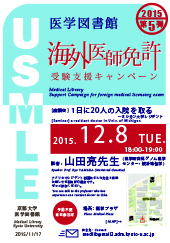 We will be holding a talk session having a doctor who is successful in the U.S. and graduated from Kyoto University. 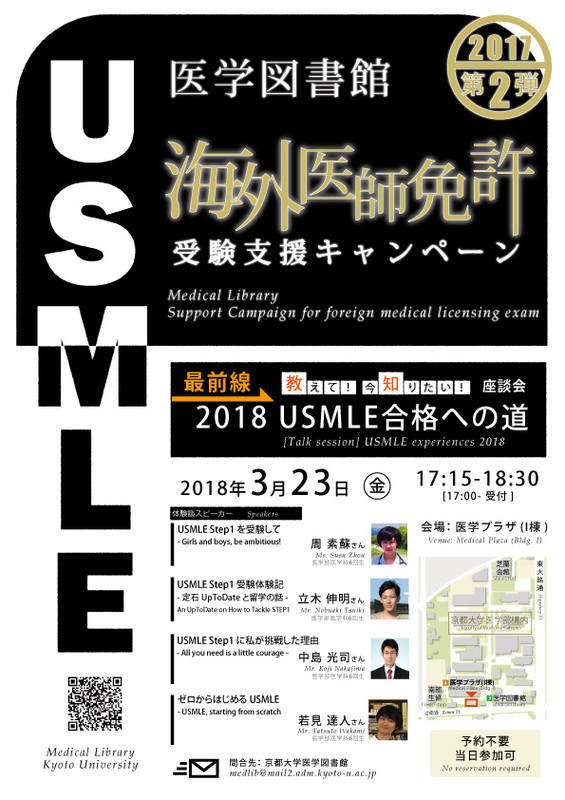 This is a must for those who are planning to take the USMLE. Please click the poster to check a map. 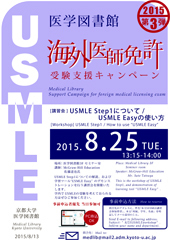 USMLE Step1を受験して - Girls and boys, be ambitious! We will be holding a talk session having a doctor who is going to join an internal medicine residency program in NY from July. 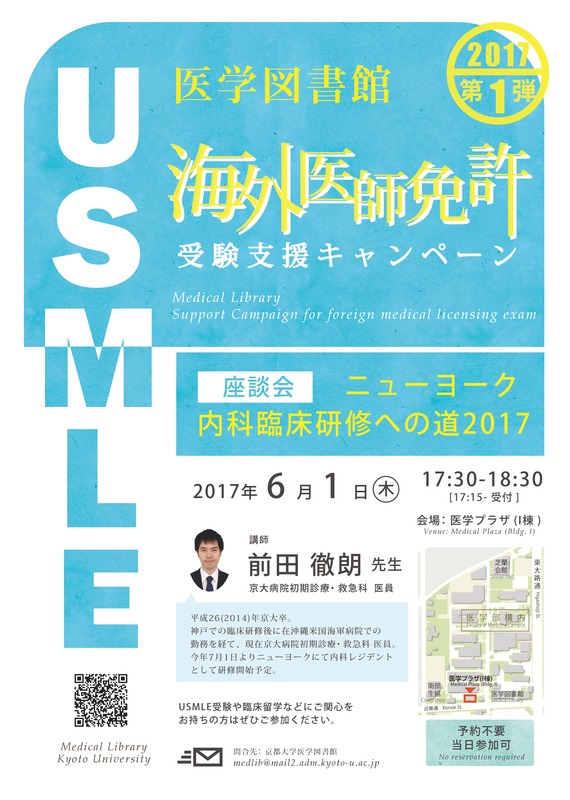 This is a must for those who are planning to take the USMLE. There is no need to apply in advance. Dr. Peter Edelstein is an award-winning physician educator, author, and acknowledged health reform expert who regularly appears on radio, television, and in print media. After completing a five year surgical residency at the University of California, serving two years as a National Institutes of Health research fellow in an advanced surgical oncology research laboratory, and then matriculating from the University of Minnesota Colon & Rectal Surgical Fellowship, Dr. Edelstein received board certification from both the American Board of Surgery and the American Board of Colon & Rectal Surgery. Dr. Edelstein was then invited to join the Stanford University School of Medicine faculty, where he practiced and trained students and residents in the surgical treatment of advanced gastrointestinal diseases, with a particular focus on the evaluation, genetics, and treatment of colorectal malignancies, as well as teaching surgical critical care and trauma. In addition, he served as the Associate Surgical Residency Program Director, developing, guiding, and evaluating the major aspects of Stanford's surgical internship and residency training program. Dr. Edelstein then moved from his academic clinical practice into the entrepreneurial medical "start-up" world of the famous Silicon Valley, where he served as a founding officer in two venture capital funded companies, including roles as Chief Medical Officer and President & Chief Executive Officer. In over a decade in this exciting industry, Dr. Edelstein directly raised over $100M USD for his novel surgical device companies and also consulted for venture capital investors. Now serving as Chief Medical Officer for Elsevier, the world's leading provider of technological, scientific, and health content, Dr. Edelstein is widely sought after to deliver visionary presentations and engage in thought leadership conferences all over the globe. To learn more, please go to www.DrESpeaks.com. We will be holding a workshop and medical specialization session having an instructor from the Kaplan Medical. 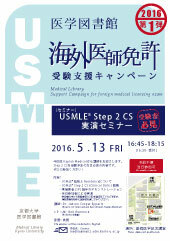 This is a must for those who are planning to take the USMLE Step 2 CS! A few attendees will participate in the session with a standardized patient on stage. You can talk to the doctor who has career of MPH(Master of Public Health) in USA. Click the poster to check a map. There will be an academic session of KUSPH & HSPH at 16:00-18:00 on Mar.16 Wed. at Building G 2F Seminar room A. You can talk to the doctors who have experience of working in USA and Australia. 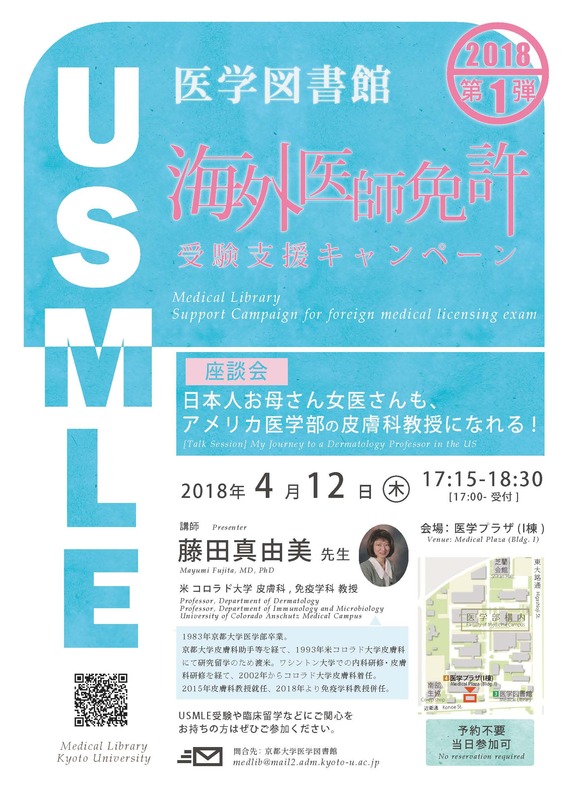 "Pediatric Cardiac Surgery in USA"
"Overseas training in Australia - Innocent Japanese in Easy Aussie"
You can talk to the professor who has experience as a resident doctor in USA. 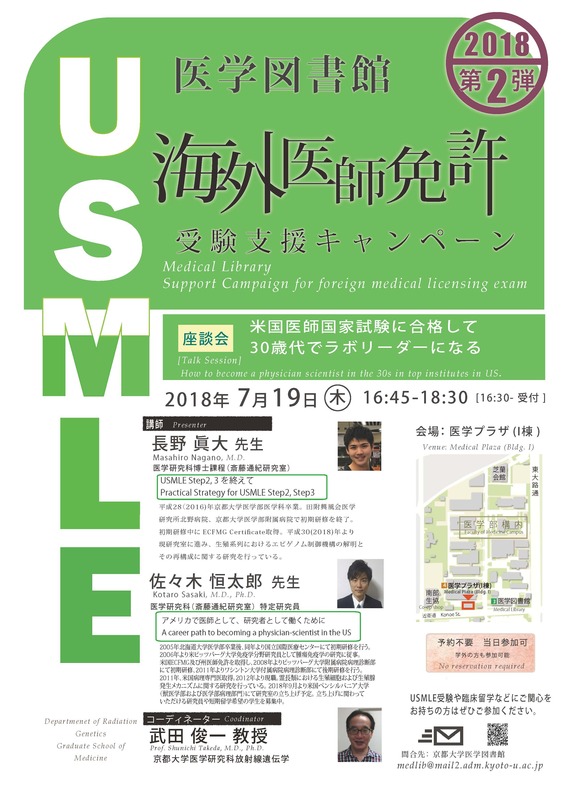 Part.3 [Workshop] USMLE Step1 / How to use "USMLE Easy"
This is the workshop of USMLE Step1, and demonstration of learning tool "USMLE Easy". 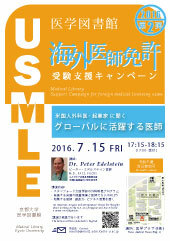 Send E-mail to medlib[@]mail2.adm.kyoto-u.ac.jp (Please change [@] to @), Subject: "8/25USMLEworkshop". Inform your name and department. "USMLE Easy"trial is available now. 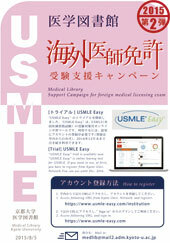 "USMLE Easy" is online learnig tool for USMLE. 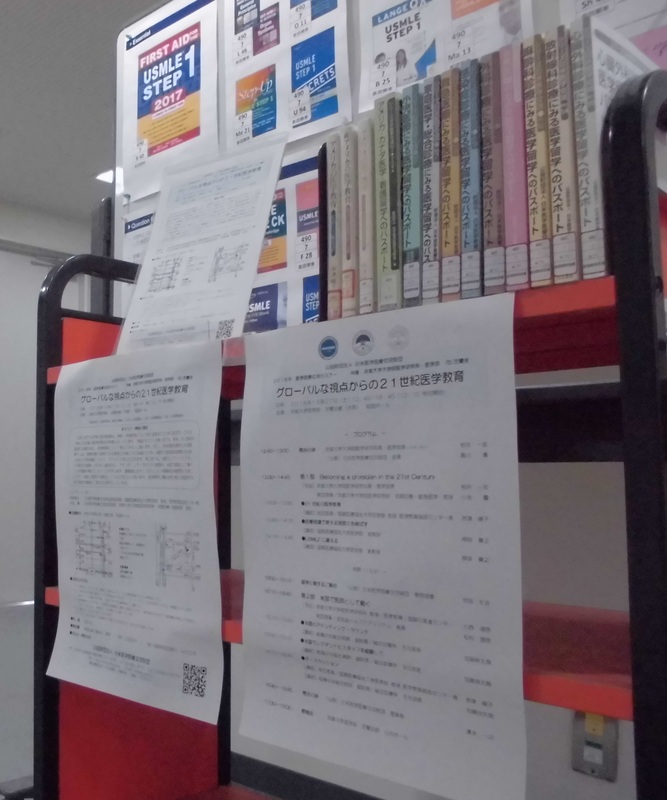 If you want to use, at first, you have to register from Kyoto Univ. Network. Access following URL from Kyoto Univ. Network, and register. Access following URL, and sign in. 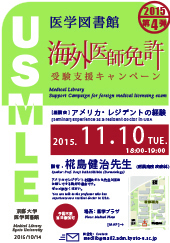 Requests to the Medical Library to purchase books for preparing for the foreign medical licensing exam, ex. USMLE etc., will preferentially be added to the library collection. 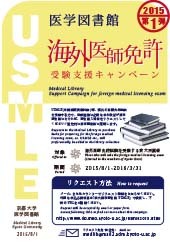 You can check study materials for USMLE in Medical Library from this list. Request will be accepted by email or paper form. [@] は @ にして送信してください。Please change [@] to @ to send e-mail. Please write "USMLE Book Request" in the subject line and copy the following contents and fill in each item with as much details as possible. Please fill in the request form at the Medical Library. We will notify you about a purchase within a week. Copyright (C) Medical Library, Kyoto University All Rights Reserved.